I feel bad for not writing stories related to the procedures that I have done since I was diagnosed with breast cancer in 2014. I feel like I have so much to share about the whole journey that I have to go through as a breast cancer survivor. It was only 3 years ago and even up until now, I am still continuing my medication and under close observation of my oncologists. Early Detection...As easy as 1,2,3,..
Rasanya belum lama saya mendengar vonis kanker payudara dari dokter umumku yang baru saja bertemu setelah 2 bulan saya berada di NYC di tahun 2014. Dan Oktober 2017 kembali menghampiri. Tahun ketiga saya menyandang predikat sebagai peretas kanker payudara. Ada begitu banyak cerita, penuh suka duka dan semoga informasi berharga, yang ingin saya bagi dengan teman-teman semua. Tentu saja saya berdoa teman semua bisa selalu sehat dan prima, namun mungkin saja cerita perjalanan saya berjuang melawan kanker bisa bermanfaat bagi saudara, rekan, teman, tetangga, kerabat atau siapa saja yang membutuhkannya. So this time, let me share some stories about Genetic Test for Breast Cancer Patients. I remembered when I have finally agreed to take genetic test in relation to the breast cancer I have. If you have heard of Angelina Jolie-Pitt story and her double mastectomy for avoiding cancer that apparently runs in her family, then perhaps you are aware of genetic cancer. 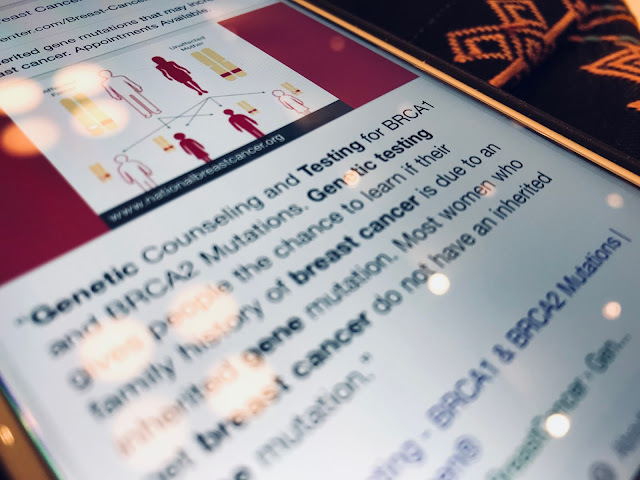 As I read on cancer.org, "about 5% to 10% of breast cancer cases are thought to be hereditary, meaning that they result directly from gene defects (called mutations) passed on from a parent." It means that if you mom, or your aunt, or your first-degree family from your mother sides have the history of cancer, particularly breast cancer, then there are big chances that you have have high risk of having breast cancer as well. And if you read more about genetic test for breast cancer patients, perhaps you see the term BRCA1 and BRCA2 often. Cancer.org further stated that "the most common cause of hereditary breast cancer is an inherited mutation in the BRCA1 or BRCA2 gene. In normal cells, these genes help make proteins that repair damaged DNA. Mutated versions of these genes can lead to abnormal cell growth, which can lead to cancer." I have been warned that it is not a cheap procedure. It's an expensive test indeed and I gotta to admit that the first question I have is whether the test will be covered by my insurance. Frankly, with all the series of treatment that I have to go through and the work I have at the office, paying extremely expensive bill is the last thing I need right at that time. But after consulting with my insurance at that time, it was indeed covered. So, in the middle of my Herceptine treatment, I decided to take the test. Having my aunty from my father's side just recently being diagnosed with breast cancer and not to forget that I have my little daughter as well, I am intrigued to know whether cancer is actually in my genes or not. I feel like if I know it for sure, then I know what to do to make sure that my daughter Obi is all good. "The BreastNext gene panel performed by a specific genetic laboratory has tested for 17 genes associated with hereditary cancer, including the high risk breast cancer genes, BRCA1, BRCA2, PTEN, TP53, and CDH1." That's what the booklet I have received about the test specifically mentioned. It might sounds familiar to some of us but for me, the genes and all that are new things that I need to learn more. So, basically, these genes I mentioned above will mark whether I have the cancer because of my family history or because of something else. And if I do, it means, my daughter Obi will have a high risk. Thinking about your wonderful daughter having to endure the same struggle against breast cancer :(. So, again, in one of my Herception sessions, I have took the test. Nothing much to do but a lot of discussion and some blood draw. Yuup..tubes of samples of my blood for the test and that's it. I just need to wait for the result. Before that, I was asked quite a lot of questions regarding the family medical history, particularly cancer. From both my mom and my dad's sides. I have been trying to remember, and ask around, about this family history. Apparently my aunty from my mom's side has breast issue, but not breast cancer. And my grandpa from my father side had throat cancer, while my aunt from my dad's side has breast cancer as well. After approximately 3 weeks, the result has come back. You know what the result is? Do you know what it means? First I got confused but then after reading the result and discuss a lot with the genetic consultant, I can have a relief. As I read from the summary of my genetic test report, it is concluded that the panel from my test did not detect any known deleterious mutations. Furthermore, I also tested NEGATIVE for mutations in the remaining genes on the Cancer Gene Panel, including: ATM, BARD1, BRIP1, MRE11A, MUTYH, NBN, NF1, PALB2, RAD50, RAD51C, and RAD51D. However, a variant of uncertain significance (VUS) was identified in the CHEK2 gene, known as c.538C>T (p.R180C). "When testing through multi-gene panels, detecting variants of uncertain significance is common. Specifically, a variant of uncertain significance means that a change in the DNA sequence was detected, but its impact on cancer risk is not fully understood. The laboratory that performed the DNA analysis does not have a test at this time to determine the effect the variant has on the gene function and cancer risks. We discussed that over time, as the lab collects additional information about these variants, they may be able re-classify them. Should the variant of uncertain significance be reclassified by the laboratory, the genetic counselor will receive an updated report." Although many variants will ultimately be re-classified as benign, at this time your patient's result should not be considered positive or negative. It is important to realize this test did not determine the underlying cause of her family history of breast cancer. The specific recommendations about her management and future screening depend on the characteristics of her age and other personal risk factors. The family history of breast cancer should still be considered when considering appropriate cancer screening. We recommended she discuss this further with you and her other physicians. As discussed with the patient, although this reduces the chance that Ms. Savitri has an inherited susceptibility to breast cancer, not all of the genes that may cause inherited breastcancer susceptibility have been identified at this time, so the chance of inherited breastcancer susceptibility cannot be ruled out completely. It is possible that more gene tests will be available in the future that might be appropriate for the patient and her family. We discussed that in regards to risk for other family members, such as Ms. Savitri’s mother and daughter women who have a first-degree relative (mother, sister, or daughter) with breast cancer have approximately twice the risk to develop breast cancer compared to women in the general population. This risk would be higher in the presence of other relatives with breast cancer. This risk may be due to shared genetic and environmental factors, even though the results of genetic testing such as for BRCA1 and BRCA2 may be negative. The lifetime risk for women in the general population to develop breast cancer is 1 in 8 or 12% to age 70. Testing family members for the VUS is not indicated at this time. Recommendations for family members should be made based on personal and family history and risk assessment. No changes should be made to this patient’s surveillance practices without them first having a detailed discussion with their physicians and these options may be further modified on a case-by-case basis with the patient’s referring physician. Given the results of genetic testing, no changes to Indah's care is indicated at this time. Management recommendations are not indicated for a VUS in the CHEK2 gene alone. Instead, management recommendations will be made based on personal and family history and risk assessment. When no mutation is detected by the these gene panels, current recommendations suggest that women with a family history of breast cancer begin screening 10 years earlier than the youngest age at diagnosis in the family. Because these recommendations change over time, it will be important for them to discuss the family history with their physicians." That's literally the copy of the report and my test's result. It know it might be a lot to chew but in conclusion, my cancer is not coming from my genes. It is not hereditary. The fact that my aunty from my father side had breast cancer as well is pretty much the personal medical problem, not because of our genes. It was such a relieve as it means that Obi doesn't have to bear the consequences of have her mom as a breast cancer survivor. Of course she needs to live healthy like each and everyone of us, because nowadays, there are so many triggering factors which make us more vulnerable with cancer. I also had this test done a few years ago. I think then it was right around $5,000, but thankfully my insurance at the time picked up the tab. I didn't have any markers for mutated genes, thankfully. My husband's boss got a double mastectomy because she had a lot of relatives that got breast cancer. She said she had a lot of people judge her when she had it done, but felt better about doing it. I do know that the tissue by the armpits could get breast cancer as well. I hope she's clear of getting it! In our family we carry the Trisomy 18 - what my nephew has. My mom had a baby before my sisters and I that only lived a few months. They adopted my oldest sister, tried with me (I'm not a carrier), and had my surprise sister (she is a carrier). My sister had 1 baby that only lived a few days with it, has her 12 yr old that is a carrier, has her 9 yr old that isn't carrier, had a miscarriage, had my nephew that is 6 with it, and my nephew that is 3 (we don't know if he's a carrier, but he doesn't have trisomy 18). We've had fights in our family about how we wish my sister was done having children. We all help so much. She sees it as her, and only her business. It's a touchy subject. Waaah Kak Indah you're so inspiring! Semangat kak, jadi kita itu harus memang tau segala gejala yah kak. Agar segera cepat disembuhkan..
Ngeri ya beb klo Uda kanker, smoga gak kena penyakit aneh2 deh, pengennya tetap sehat. Aku pernah ikutan acara LovePink Indonesia, dan banyak juga penyintas kanker payudara yang membagikan pengalaman mereka dan berbagi cara mendeteksi lebih awal lagi. Thank you so much mba udah ngingetin lagi melalui post. Semangattt! Salut banget sama perjuangan kak Indah untuk melawan kanker dan jadi survivor. You are indeed a strong woman. Semoga selalu diberikan kesehatan ya kak. Aku sih saat ini berusaha menghindari gaya hidup tidak sehat dan melakukan pengecekan payudara SADARI. Tapi mungkin perlu juga ya cek langsung ke dokter.